An 11″ x 14″ Calligraphic Membership Certificate stating your pioneer ancestry. Invitations to all events and programs including several members-only events: The President’s Picnic, The Albert Shumate Lecture, The Christmas Convivium, The Gold Discovery Party, and the Annual Meeting. 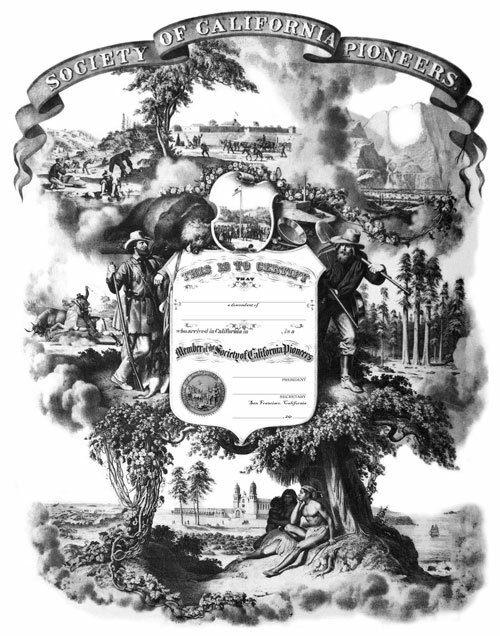 Subscription to the Society’s Journal, The PIONEER, featuring articles on California history as well as paintings, artifacts, manuscripts and photographs from the Society’s collection. Subscription to the Society’s newsletter, The PIONEER EXPRESS, featuring upcoming events, member and activity notes, and Society information. A roster as it is made available. If you are eligible for membership and wish to join, please contact the Membership Services Coordinator by completing this request form.